The partly pre-printed wrapper shown below caught my eye for my Trieste collection, but I did not really know what it was. It dates from 1913, and has a 3kr imprint, the correct rate for inland printed-matter up to 50g. The illustration shows the plane in which Blériot crossed the English Channel in 1909. Since acquiring this wrapper, I have seen several similar items in the catalogues of Vienna auction houses, all addressed to different cities. All have the same illustration of the aeroplane, and all have the destination-town pre-printed or hand-stamped, along with the salutation in the appropriate language pre-printed. The wrapper below, for example, is in the Hungarian language; the wrapper above is in Italian (albeit with "Trieste" spelt the German way!). The auction-houses concerned both included the wrappers in their "air-mail" section, rather than their "private postal-stationery" section. 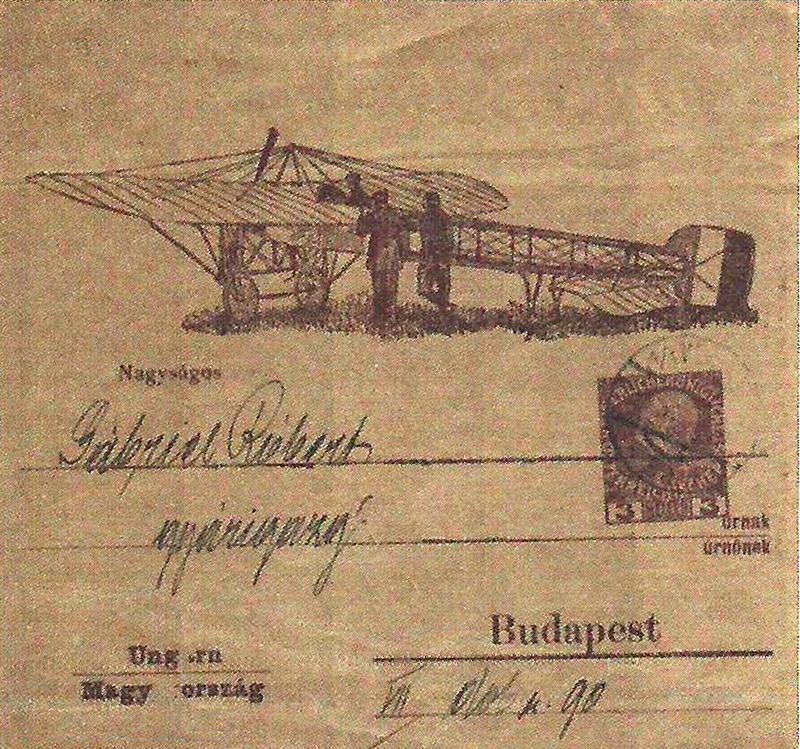 Although depicting an aeroplane, the wrapper pre-dates scheduled air-services in Austria, and has nothing to do with air-mail. Is there anything else we can deduce from a wrapper without contents? Such wrappers were usually used for newspapers, magazines or leaflets; nothing too substantial in this case because it weighed no more than 50g. The printed text on the rear of the Trieste wrapper is: "Campione Gratuito a richiesta e Franco Porto. Vedi penultima copertina di questo opuscolo". I translate this as: "Free sample on request with free postage. See the inside back-cover of this brochure". So it seems that the contents of the wrapper were a leaflet promoting a particular product and inviting the recipient to send off for a free sample. Is the aeroplane of any significance? Powered flight was in its infancy and commercial flights had not started in Austria. It's hard to think of a product connected with air-travel at that time that could have been offered as a free sample in a mass-mailing. My guess is that the brochure had nothing to do with air-travel, but that the aeroplane was an attention-grabbing topical motif. to Trieste. Pre-printed salutation (in Italian) and destination-town (in German). The salutation is preceded by a pre-printed "Stimat. ", which is a polite formality meaning "esteemed"
to Sušice (in Bohemia). Salutation and BÖHMEN / CECHY pre-printed, destination town rubber-stamped. The sending-organisation couldn't generate address-labels from a computer, as we would today, and the names and addresses had to be hand-written. To lessen this task, as much was pre-printed as possible. We can start to see how this large mailing was organised. Firstly a quantity of wrappers was procured, printed with the 3h imprint and aeroplane. 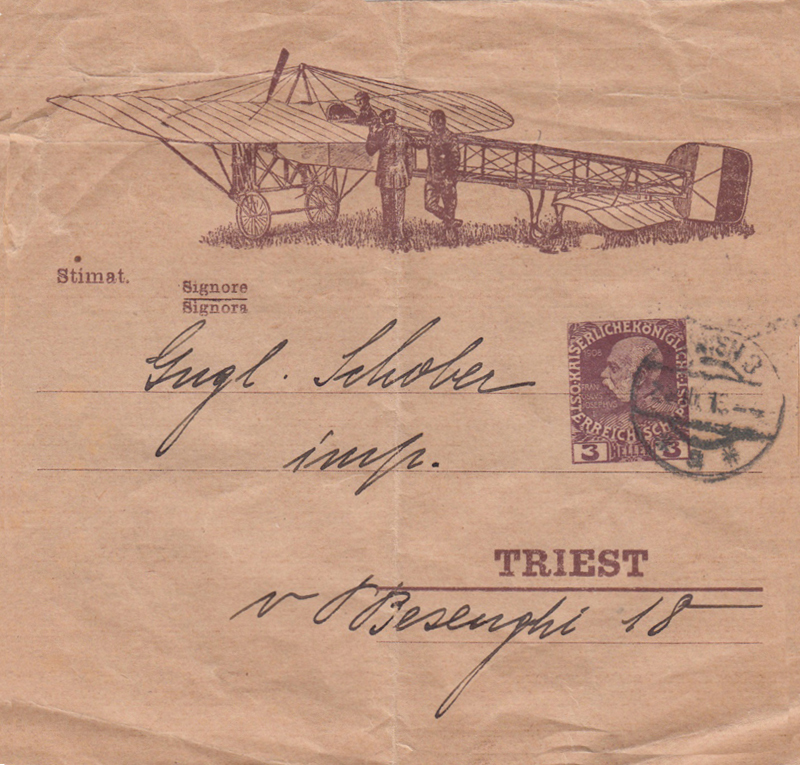 Major destination-towns, such as Vienna, Prague and Trieste, had sufficient potential customers to warrant sending some of these wrappers back for further pre-printing of the salutation and town-name. For medium-sized markets, such as Sarajevo and Gablonz, additional pre-printing of the salutation, and procurement of a rubber-stamp, were still warranted. Presumably for potential customers in small destinations, the whole name and address had to be handwritten. That's still a lot of handwriting if it all had to be done in a short time-frame. The postmark dates are not all easy to read, but the Gablonz date appears to be 21 October, Prague 5 May and Sarajevo 2 April. It may be that the sender mailed one city or region at a time on a staggered basis through the year, and had an envelope for each town over-printed when needed. There seem to be some parallels with the mailing of the magazine of the DuOAV to its members before the First World War. In that case, the mailing was so large that not only was the mailing of each issue, staggered over several days, but the Austrian Post Office permitted the use of pre-cancels to postmark the stamps. I would be very pleased to hear from anybody who has more information about these aeroplane wrappers, particularly if they have one with surviving contents! My thanks to Joyce Boyer who has helped me find examples in auction-catalogues and to Steve Schweighofer who contributed the Sušice example.